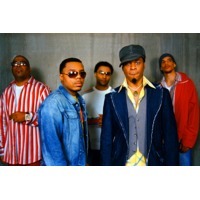 Mint Condition is an R&B band from Saint Paul, Minnesota. Formed in the late 1980s, its original members were lead singer (and in-studio drummer/percussionist) Stokley Williams, bassist Ricky Kinchen, guitarist Homer O'Dell, pianist Larry Waddell, keyboardist Keri Lewis, and keyboardist/saxophonist Jeffrey Allen. Currently, this line-up remains intact, with the exception of Lewis, who left the group to produce for other artists. The group is well known for its highly diverse musical style (able to play anything from traditional jazz stylings to mainstream R&B and rock-based music to funk grooves and even Latin and Jamaican-based rhythms) and also its captivating live performances. The band is also well known for their well written and produced R&B ballads, mainly in the 1990s.